The Walking Dead: Survival Instinct is a single-player FPS developed by Terminal Reality and published by Activision in 2013 for PlayStation 3, Wii U, Windows, and Xbox 360. The game is based on The Walking Dead television series, in contrast to a series of games by Telltale Games, which is based on the comics. 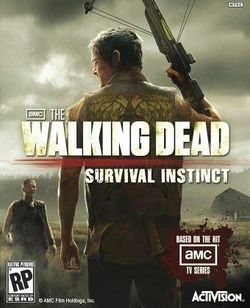 The Walking Dead: Survival Instinct acts as a prequel to the TV series; it is set in the Georgia countryside and focuses on Daryl and Merle Dixon as they make their way to Atlanta during the early days of the zombie apocalypse. In the midst of a zombie outbreak and shortly after the death of Daryl Dixon's father Will Dixon, Daryl and his half-uncle Jess Collins escape their mountain shelter in Cabot Ridge to gather supplies in the nearby town of Sedalia. During the scavenger hunt for fuel, Daryl meets Jimmy Blake, the last standing police officer of Sedalia, on the top of a roof, who requested Daryl to find radio batteries to call for help. In a nearby gas station, Daryl meets Warren Bedford, who gives fuel to Daryl under the condition that he joins the group. The trio then escapes with the newly acquired fuel, this time heading to Pembertom. The trio must continue to survive amongst the outbreak.